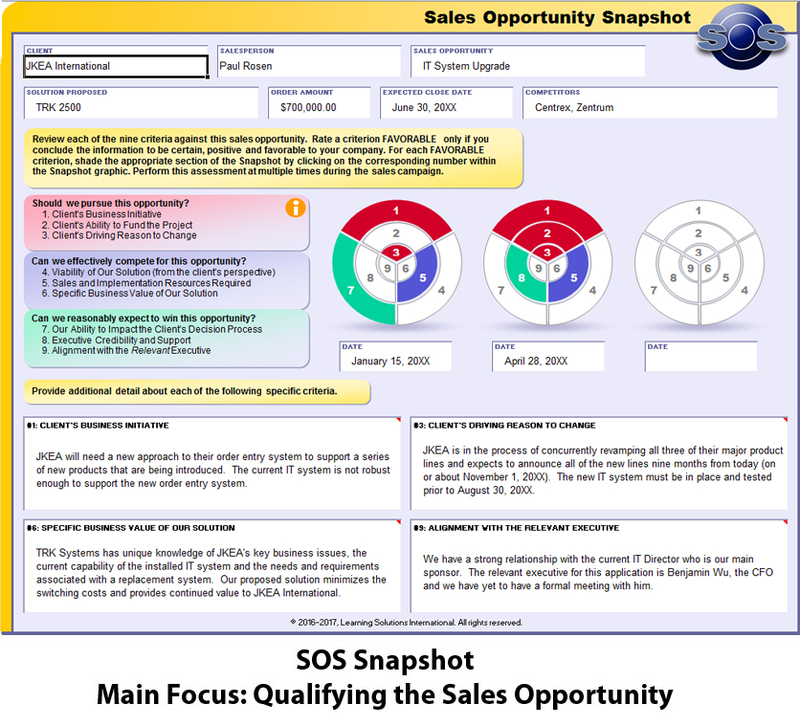 SOS (Sales Opportunity Snapshot) is the next-generation in opportunity management for enterprise sales organizations. It provides a structured, scalable process for qualifying, planning and winning strategic sales opportunities where competitors are strong and customer buying protocols are influenced by formal and informal decision criteria. Sales representatives, sales managers, and business development professionals who face long sales cycles, tough competition and multiple key players in the buying process. Qualify the Sales Opportunity using a Snapshot assessment of the nine key criteria that determine if you should pursue or disengage from any deal. Align with the Political Landscape using the groundbreaking Influence Map to examine both formal and informal power and find the relevant executive for the sales opportunity. Establish a Competitive Sales Strategy by examining your company's relative strengths, weaknesses and positioning compared to competitors, and plotting which of three sales strategies will accelerate your sales velocity. Develop a Value Proposition to align with the business and political dimensions of the buying process in a way that creates new value for the client. 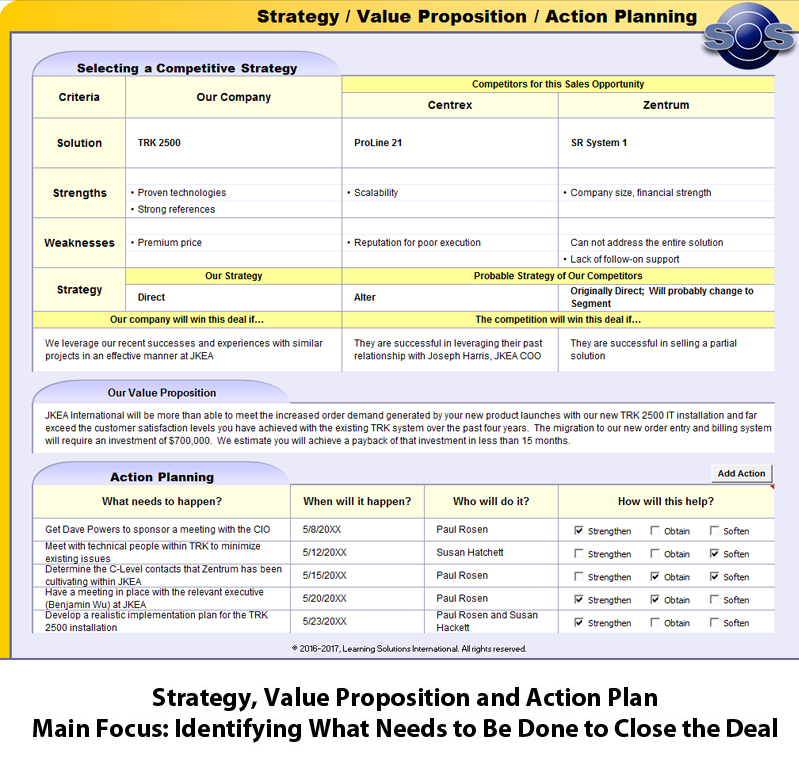 Develop an Action Plan that aligns with your sales strategy and defines the specific steps that you need to take to quickly close the deal. Download our one-page SOS Flyer for a high-level overview of the SOS Workshop. ​ Take an in-depth look at the workshop details, including workshop objectives and module content, with our SOS Design Document. 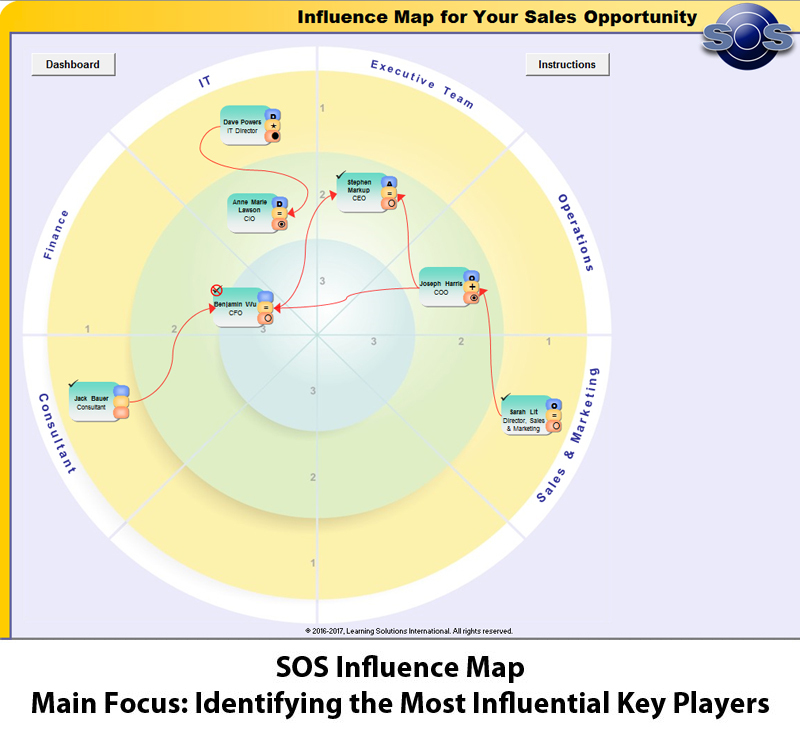 Included in the SOS Workshop is the SOS software tool.This tool extends and reinforces the workshop learning by giving your sales force an intuitive, easy-to-use interface that tracks all key data and progress made throughout the sales opportunity cycle. The output of the SOS Tool is a concise, compelling and extremely visual, three-page Opportunity Plan. Click an SOS screen shot below for an enlarged view of each page of the three-page Opportunity Plan. Improve Sales in a Snap!